Nourishes, moisturizes and protects against UV rays. Free from synthetic sunscreens and preservatives, our waterproof, SPF 30 petroleum-free Himalaya Herbals SunProtect Lip Balm is specially formulated using vegetable oils and natural sun block to nourish, moisturize and protect your lips from harsh UVA and UVB rays. Our lip balm is enriched with Sunflower Seed Oil which effectively moisturizes and nourishes your lips. Grape Seed Oil protects against the harmful effects of UV rays, leaving your lips soft, smooth and protected. 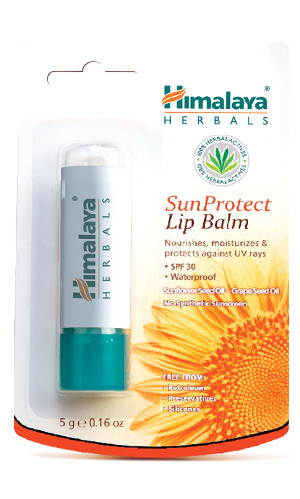 Apply Himalaya Herbals SunProtect Lip Balm liberally on lips when needed.